So why, one might ask, has a very bizarre movie been filmed on location there featuring the Shiva 'Dance Of Destruction'? Yes, in fact, a statue of Nataraja depicting the Hindu god Shiva was dedicated there on-site back in 2004 when CERN was first constructed. 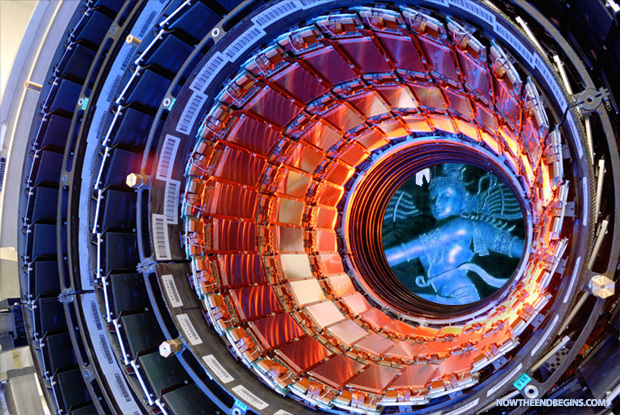 The Large Hadron Collider (LHC) is the world’s largest and most powerful particle accelerator. It first started up on 10 September 2008, and remains the latest addition to CERN’s accelerator complex. The LHC consists of a 27-kilometer ring of superconducting magnets with a number of accelerating structures to boost the energy of the particles along the way. CERN, the European Organization for Nuclear Research, has its headquarters in Geneva. At present, its Member States are Austria, Belgium, Bulgaria, the Czech Republic, Denmark, Finland, France, Germany, Greece, Hungary, Italy, the Netherlands, Norway, Poland, Portugal, the Slovak Republic, Spain, Sweden, Switzerland and the United Kingdom. India, Israel, Japan, the Russian Federation, the United States of America, Turkey, the European Commission and UNESCO have observer status. CERN Council is the body in which the representatives of the 20 Member States of the Organization decide on scientific programmes and financial resources. So why, one might ask, has a very bizarre movie been filmed on location there featuring the Shiva ‘Dance Of Destruction‘? Yes, in fact, a statue of Nataraja depicting the Hindu god Shiva was dedicated there on-site back in 2004 when CERN was first constructed. The bible clearly tells us that the Hindu “dark one” who inhabits the “burning ground” is none other than Satan himself. Is the picture starting to become clear to you now? The same “science” that inspired the builders of the Tower of Babel, men who like Satan said they did not need God to reach Heaven, is also behind the work of the people at CERN. People who have dedicated the whole of their research to the “dark one”.